Without the wedding posters is not carried out there is no wedding. They add fun and joy to the occasion. A poster you can buy in the store or order in the printing, but the poster made by your hands, it will be much more pleasant for the newlyweds and their guests. Posters for the wedding it is better to do one person but a whole group of people. By joint efforts, thanks to the imagination of a few friends, the result will be much better. Wedding posters can be put up not only in the Banquet hall, but also on the landing where the apartment of the bride. It is possible to arrange the ransom of the poster or with the assistance of some contests. To the poster, you may need a sheet of paper or Wallpaper, pencils, pens, markers, scissors, colorful ribbon, gouache for the application of volumetric labels, stencils with letters, ready letters, stickers. For writing the best wishes to find among your friends the person with calligraphic handwriting. The poster must carry a funny, comic and entertaining as this celebration. But there can be as funny excerpts, and wise sayings on the relevant topic. They are easy to find online or create themselves. These inscriptions it is better to draw appropriate meaning pictures to be interesting. You can make a photo collage with pictures of the newlyweds, their friends, mother-in-law, father-in-law, mother-in-law and father-in-law. In this case, better pictures to trace with a marker or felt-tip pen to brighter to highlight them. A good addition to them will be humorous collages. The poster can do a montage with photos of the newlyweds, where they live in the rich Villa, resting on the Islands and so on. And you can place pictures of them, ranging from infancy to the present time. A pleasant surprise for the newlyweds will be invited painters to the wedding, where they in the draw the young. This poster will be kept for many years. Well, if the poster there is a place where everyone will leave their wishes for the young. The same poster may be separate from the main. It should also be decorate and make a sign from above, inviting guests to leave their wishes. Also at the wedding posters can be glued pockets for money with the appropriate inscription: "daughter", "son", "car", "the coat" and so on. The background of the poster should not be white, better make it colorful. - You and I are a family now. He married itself - help a companion! - Missed the girls boyfriend! - Son-in-law plus father - in-law a bottle is! If a wedding take is don't forget to smile! What kind of poster you decide to decorate the wedding, it needs to be done with soul and love. Decoration of wedding celebrations – it is quite complicated. It requires a creative approach and original ideas. 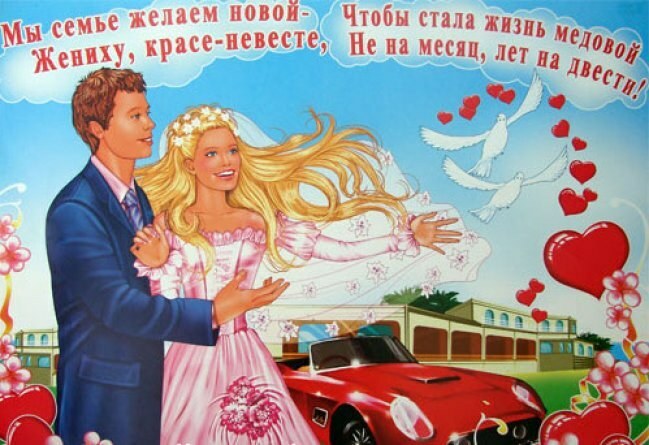 Currently it has become fashionable to create wedding posters themselves. Custom wedding posters reduce costs for designing the event, and working together groom and bride contributes even more to bring people together. Posters made different from printing originality and expressiveness. They are always individual. Typically, a sheet of drawing paper contains memorable images, pictures, wishes and humorous inscriptions. Many future newlyweds are organizing a wedding in a certain style, therefore, the poster should be made in a suitable form. Through a variety of drawings to convey the mood, to tell the guests the unknown facts from the biography of young. Basically, this creative process lay on the shoulders of the bridesmaids, sometimes attract friends with the groom. However, if the scenario is foreclosure needs to remain a secret, the poster created by the entourage of the future of his young wife. 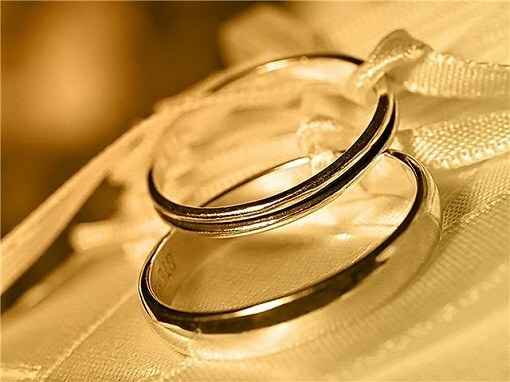 It is recommended to design the poster for a dayor two before the wedding date. On the day of the celebration it can be hung in a stairwell or on the door. This decoration will enliven the house and will give the event a special charm. - post images and photos in harmony, that is, to assemble them in small groups. Pretty original design wedding poster can be a collage, created on the basis of photographs of the bride and groom. Here positive traits that visually show interesting Hobbies the future family, to note the progress on the labor front. In the simplest version of all plans applied on a clean sheet of drawing paper. Such material allows the use of any equipment clearance and retains its original shape. You need to buy gouache, pens, markers, pencils. Should think in advance about the method of attachment of the poster. It can be duct tape – if it will hang on the wall or safety pins – if you plan to attach it to the fabric, e.g. curtains. If the assistants of the bride is no artistic talent, you can find the original pictures on the Internet, and then beautiful color. Many people decorate the poster with ribbons, bows, sequins. If you have the skills work in graphic programs it makes sense to use these skills to prepare the layout and then print it on a color printer. This poster will look more professional.